Praying for the sick is not unusual. It is expected. In Mark 16:18, we hear Jesus giving the great commission and He ads that believers “will lay hands on the sick, and they will recover. Praying for the sick is one of the things believers do! And to do it, Jesus said that we would lay hands on people, not to just say a prayer over the telephone. It is a matter best done in person; being close enough to lay hands on the sick person’s body. After all, all flesh is grass (Isa.40:8) and Jesus died for the sick as well as well as the healthy. We all belong to the same body of Christ. Laying hands identifies that what is needed and sufficient for one is enough for all. James 5:14-16 also instructs us to pray for one another’s sicknesses, telling us to “call the elders of the church” for this specific task. Prayer for the sick was intended to be a top priority of church leaders as well as lay. By suggesting that the elders are to be involved, James showed that he understood that when a person is sick, not every friend is going to build you up and pray in faith! Job had friends that spoke frivolously because they were not mindful of his condition nor did they understand God. Job swiftly spoke, “I also could speak as you do, If your soul were in my soul’s place. I could heap up words against you, and shake my head at you.” (Job16:4) They saw Job in his pain and made accusations of his character instead of building faith. Don’t surround yourself with unbelieving friends like Job did! 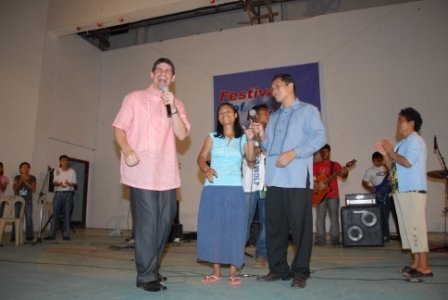 Picture: Young lady in the Philippines was healed of breast cancer!